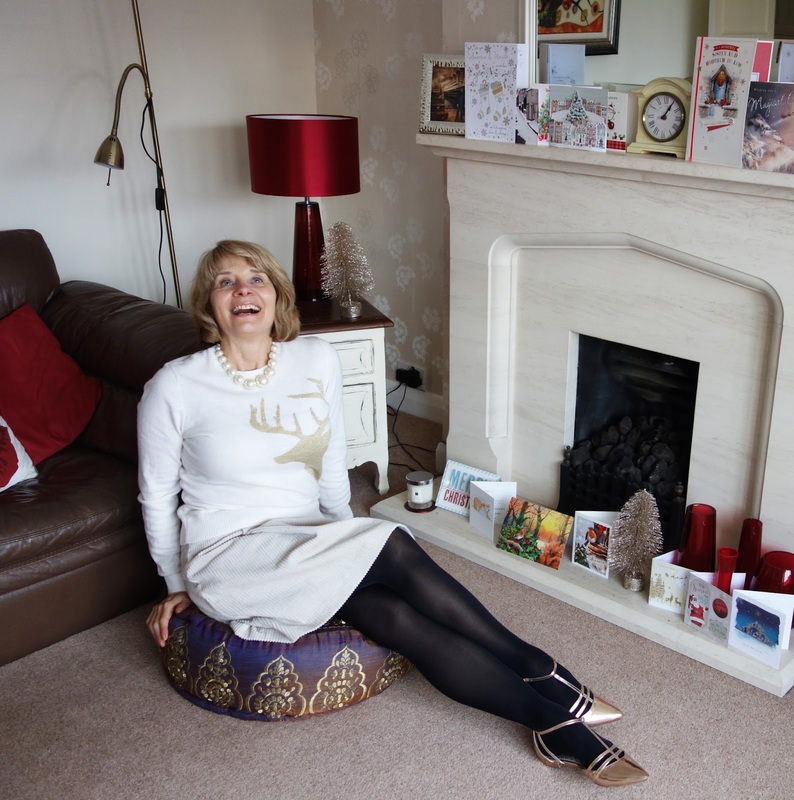 Bargain red tartan and a classy reindeer jumper | Is This Mutton? A word about the minimalist Christmas tree. I couldn't face putting up the normal Christmas tree this year, even though I usually love the ritual of getting out the treasured decorations and adorning the tree to the background of Nigella Christmas on TV. John urged me to rethink and perhaps get a smaller tree (he always complains about the TV screen being obscured by branches). The tree in the picture is the easiest tree ever. It was in a remarkably small square box and is simplicity itself: you simply put together the metal frame and then unfold the tree and lower it down over the frame. It is already pre-lit with decorations. 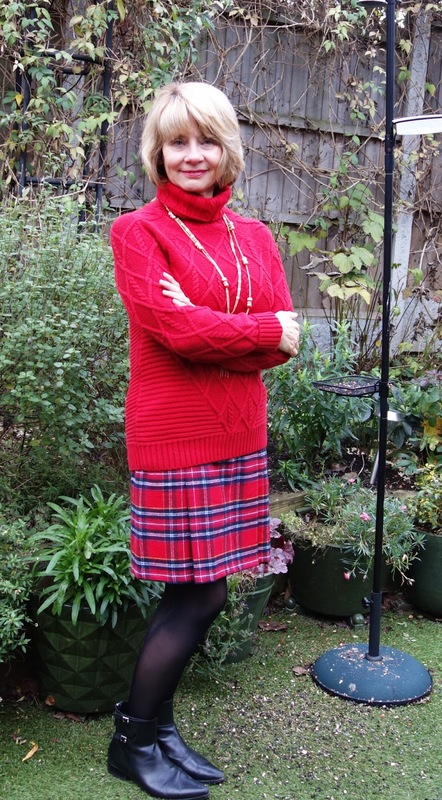 The red tartan ensemble will probably be my Boxing Day outfit, although with temperatures in London predicted to be as high as 14 degrees, it may be a bit too warm indoors for the chunky jumper. Red tartan skirt, £16, Sainsbury's; roll neck jumper, Sainsbury's; black boots, LK Bennett past season; gold chains, Accessorize, past season. For Christmas Day I'll be wearing my classy reindeer jumper, if that isn't an oxymoron. I bought it last year at John Lewis and decided it was a keeper, which is unusual for the festive jumper genre. You know how you get a bee in the bonnet about wanting a particular accessory for an outfit? I really wanted a pair of gold lurex tights but a Google search revealed that only M&S had the type I wanted, and they were in the children's section. I planned to dash into town to buy the tights targeted at 14 year olds but decided against it because I knew Oxford Street would be the stuff of nightmares. 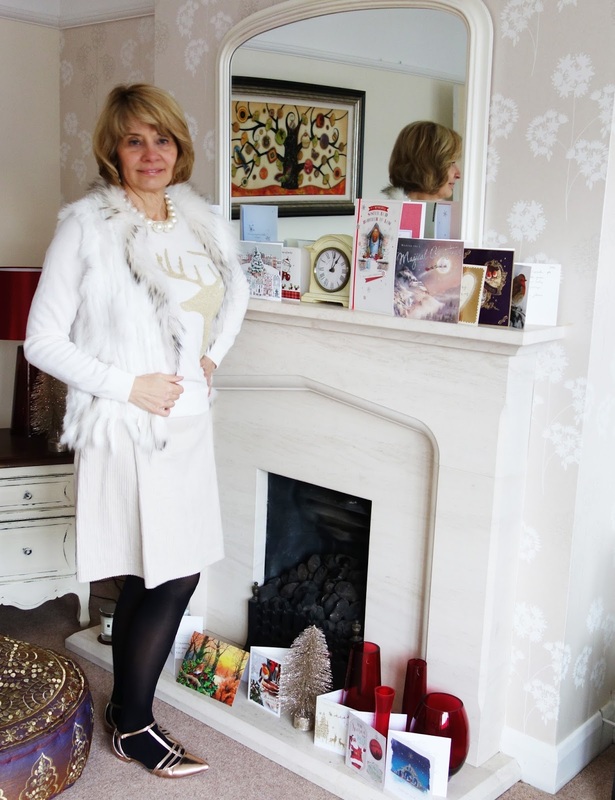 Cream reindeer jumper, John Lewis, past season; gold shoes Boden, past season; cord skirt, Boden, past season; furry gilet, Virgo fashions, past season. All clothes and accessories bought by me. FANCY FRIDAY LINK-UP PARTY and Not Dressed As Lamb, #IwillwearwhatIlike link up. I just love your confidence with all the poses and styling - you really do look great....I love the red jumper and tartan skirt outfit too!!! I love that reindeer jumper! So cute!! I hope you have a Merry Christmas! We are both got the plaid memo today! Love your look, and your home decorations are just as beautiful! I love the tree---it's so unique and fun!! I've seen a couple reindeer sweaters lately, but I love how you styled yours so modernly with the monochromatic and the fur vest!! I love your blog, and we must keep in touch. Are you on Instagram? If you are not, today is the day, please come over to the light. So much easier to keep track.